Using Black Powder rules on a pinboard! 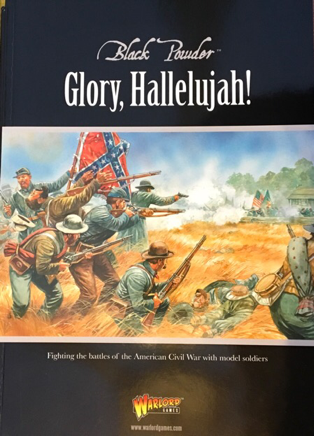 I have started looking at different ACW rules using a generic throw down scenario to see how the rules play out. 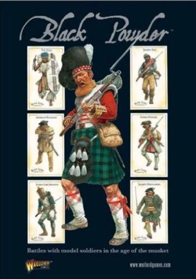 Recently the scenario was used to test boardgame rules (Musket and Saber) using 12mm figures and 4" hexes, the write-up to that game is linked in the resource section at the foot of this post. The following post looks at using the scenario to put a Black Powder game into a small space, in this case a standard large pinboard, using Kallistra 12mm figures, which hopefully proves interesting as the rules in general lean towards a much larger playing area. Rather than covering the subject with my usual written AAR, this game was recorded as a collection of short videos over a few days as the battle progressed, in the hope that serialisation helped with the presentation. As a result, the 'replay section' in this post was updated daily with the latest video links. Now that the project is complete, this post has been edited to change it from the present tense to the past tense. The Black Powder rule book is a lovely thing to own in terms of presentation, but the initial disappointment for me was the entrenched ethos that the rules were for large figures using a 12' x 6' table with substantial movement rates. Fortunately the game is scalable downwards to a smaller surface and the internet is full of accounts of these smaller games being played. I thought it might be interesting to push this hard and put a game into a 34" x 22" space (just under 3' x2' ), which are the interior dimensions of my gaming pinboard, hopefully making this post practical and useful to the space strapped gamer. To keep things simple, I used fairly generic forces, using the basic Black Powder rules with just a couple of rules and the infantry smoothbore stats from the Glory Hallelujah book (see game chart below) to give a representative action for 1862. To make the reductions in scale work, all distances were converted to centimetres and unit frontages with be 80mm. My 12mm infantry figures are based on 40mm frontages, with two bases forming a unit. However I am testing the idea of going to single large bases (80mm) or to three smaller bases (30mm each) and so the game will use all three basing elements as part of my ongoing investigation as to what kind of basing is the most practical in play (though basing considerations have more to do with my often used 10cm Kallistra hex terrain than anything else). The artillery are on a 30mm frontage and a single base represents the battery. A chap called Ian (YouTube name TheDiomedef16) recently did some YouTube videos in 6 parts over 6 evenings to show a 6mm ACW game using a variation of the Blucher rules being played out. I really liked the way he went about it and found myself looking forward to each new episode that uploaded each evening (see a link to his intro video in the resource section below). So, inspired by that, this time around, I did my AAR as a series of videos. Each presented daily over 4 days. The first just serves as an introduction to the scenario, observations and discussion about some of the practicalities of the game. The remainder show a game being played out with examples of some of the key mechanics explained. Anyway, let's crack on with the scenario details first. Generic ACW scenario - Applied to Black Powder. Background - Union forces have taken control of a river crossing and have artillery on high ground to their side of the river. Confederate forces have been ordered to take the river crossing and clear the high ground beyond. The Union have a third brigade marching to support the position. plus the Divisional Commander (Brigadier General Schenck) rated 9. Divisional Commander (Brigadier General Elzey) rated 9. 1 - the stream is wide but fordable except to artillery (who must use the bridge if they are to cross the stream). The usual 6" movement penalty for an obstruction is ignored. Instead, as soon as a unit enters the water, it's movement ends for that turn regardless how much movement allowance they have left. They can resume normal movement in any subsequent turn. This simply prevents the units crossing the feature in a single turn. 2 - the bridge - units can only cross in March Column or Attack Column. Use the amendment from Glory Hallelujah , so that units in attack column DO NOT get a combat attack or command bonus. If fired upon while on the bridge, they count as being 'not clear targets' and of course can suffer enfilade fire (those two things can cancel each other out). The bridge as a feature will block vision beyond the bridge itself, even to units looking directly up the road. 3 - Union reinforcements, at the start of each Union part of the turn, roll a single D6, if the score is equal to or less than the current turn number then ONE of the Union 3rd Brigade's regiments arrives on their board edge (in a formation of the players choosing) on the road. During that Command Phase (only) it automatically makes 1 move without rolling for orders. If this entry cannot happen because the road is occupied at the board edge by the enemy, it arrives instead at either one of its corners on its own board edge in either direction. A dice is rolled each turn in this fashion until all of 3rd Brigade have arrived in this manner. The Union Divisional commander and the Brigade commander will arrive with the first reinforcing regiment. 4 - the hill is a relatively gentle slope, but after the initial round (only) of melee (and before any potential break test) the unit that is attacking uphill will automatically be marked disordered regardless of whether it suffered a disorder result in that combat. This to reflect the rather punishing effect of crossing the water and then having to attack up-hill. 5 - all infantry units start the game with rifled muskets, however, immediately before the Confederate set-up, roll a D6 for each Confederate unit and on a result of 6, that unit is treated as having smoothbore muskets instead of rifled weapons. Those units that get smoothbore use the 'pour it on boys" rule from Glory Hallelujah. This essentially gives the unit an extra shooting dice in closing fire and short range fire, representing the faster load rates under stress that experienced troops could achieve with these weapons compared to the rifled barrels. 6 - the game lasts for 7 turns. At the end of turn 7, roll a D6, on a 5+ an 8th turn will be played. 8 - The Brigade and Army Morale rules are not used, as too many of the brigades are only 2 regiments strong. 9 - Only the Divisional Commander can give orders to the artillery. While the Union Divisional Commander is off-board, he can issue orders to the artillery (only), but his staff rating is reduced to just 5 to reflect his distance from the scene. The Confederates win if at the end of any Union turn, they have at least two regiments on the hill (regardless of who else is on the hill) and that they were the last side to have crossed the bridge and currently hold the road immediately on the other side of it. Any other result is a Union win. The Union set up first. They must place their artillery on the hill unlimbered. Their two brigades can set up anywhere on their side of the river. The 3rd Brigade starts play off the table as a reinforcement. 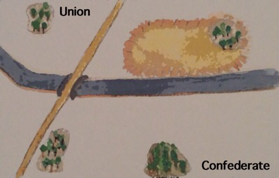 All Confederate forces set up anywhere along their baseline within 5cm (3") of the table edge (this allows brigades some scope to form up in deep formations). The artillery can begin either limbered or deployed. The terrain features shown on the below photograph are hill, road, bridge, wide stream and light woods. Only infantry in skirmish order can enter woods. Edit - the video AAR's have been taken down, but I am leaving the post in place as the rest of the material may interest and people have taken the trouble to comment. Accepting that the typical BP 28mm unit has a frontage of around 240mm, then our reduction to an 80mm frontage gives a 3:1 reduction ratio. Going from inches to centimetres gives a 2.5:1 reduction, so there is scope for further scaling down of ranges that would maintain a proper relationship with unit frontages. The best way to go about this is to have the measuring stick done in 5cm bands rather than 6cm bands, with each band obviously representing 6". So I may try this at a future point. If we did it here, it would in effect extend the width of the table in full equivalent Black Powder terms by 18 inches (caution don't trust my maths on that !). I tested the scenario a few days prior to the AAR presented here, as a solitaire game, which resulted in a fair few amendments from the version shown in the Musket and Saber rules post. Then I again ran through the scenario in a face-to-face game with Mike and it produced a good game with a few interesting and tense moments cropping up. Despite the small board, there was definitely a sense of a centre and two flanks being played out as separate entities. That game gave me cause to feel that the scenario is ready for this video AAR treatment. The conclusion of that game was that I (Confederate player) had a fully shaken left flank and my centre and right had totally collapsed - but this all happened in the last turn and at some points I did reach my victory objectives, only be ejected from them, so it seemed that the scenario is balanced enough to swing either way in this replay. Rolling for commander attributes and getting two out of the three Confederate brigades with low aggression gave a slight cause for concern regarding game balance, as this can seemed bound to disadvantage the Confederate force. But from a pragmatic point of view, since such things are the realities of war, it was embraced to add an interesting nuance to the game and in truth, it did not unhinge the scenario at all. The first video was done in daylight, but the remaining three were filmed during the evening and my lightin was not really up to the task. Further, on the last two videos, I was gaming, filming and uploading until 2 AM in the morning and that took its toll. By video 4, I am clearly tired and so the lesson from this is to do these things in daylight, when light is good and I am alert, weekends are probably best. The opening turn got off to a good start for the Confederates, with fairly significant advances. This has been in contrast to my last two playing of this scenario and is a good reflection of the dynamic style of play that comes out of this system. Brigadier - General Seibels (left flank) advanced to the bridge with the lead regiment moving in Attack Column (not March Column as I said on the video). The gap that he has opened between himself and his other regiments was ill-advised and caused command problems next turn, though it did give an opportunity to show the army commander getting involved in a 'follow me' order. Videos 3 and 4 on really get as far as turn 2, but they show the important examples of play for anyone who has not been exposed to the system. The 4th video managed to wrap up the remainder of the game. I really liked the last turn, in which decision making was taken down to the last die roll. I felt that my three plays of this scenario so far, suggested that as a platform, it is solid enough to give both sides a good game. It certainly allowed an enjoyable Black Powder game to get onto a pinboard sized space and gave some good opportunities to demonstrate the systems game mechanics, I feel that overall this post and associated videos etc. Have been a success. Thanks to everyone who stayed the journey and who supports this blog. Ian (YouTube name TheDiomedef16) mentioned above, recently serialised his game on YouTube. Here is a link to the first episode of his series - LINK. An enjoyable mix of blog and youtube. It will be interesting to see how the downscaling of rules works. The terrain is looking good. Thanks all, the next instalment should be up soon (this is more work than I had assumed!). Chris, re the Musket and Saber rules, The most obvious limitation that I find with 4" hexes and 10 12mm figures, is tha the hex often needs to hold the required unit plus any terrain (easy on a 2D map) and so I tend to go with low occupation levels. In Musket at Saber the allowance that 1 inf and 1 art can attack together set the back ground that this should be the normal stacking allowance. I don't have my notes to hand, but looking at the special rule in the scenario, I preclude two units from stacking in the stream, so I assume I limited stacking to two rather than specifically determining that it can be one infantry plus 1 artillery. But it is physical occupation that is the limiter, especially in those types of games in which each unit can have their own facing (not that that applies to M and S). Ah Yes, the claw ... a strange creature who is best trusted only to hold a pointy stick as it can't ever be trusted with the dice. Having played out this scenario as Norm's Union opponent, first with the Musket & Pike rules [designed for hex map play] and now with the Black Powder rules, I can say both gave a good game, but felt that the Black Powder was more dynamic. The latter play of this battle had several crucial moments and the final crushing Union victory could have just as easily been a triumph for the Confederates with just a few differences in the fickle dice. Totally engrossing with significant ease of play. Videos 2 and 3 were very enjoyable. Having not played BP, your demos provide a good familiarization with the rules. Break tests are decisive and bloody! Two units with light casualties dissolved quite quickly. I can rationalize the scattering as a result of melee easier than breaking and scattering from musket fire. What are your thoughts on the Break Test rolls? Thanks for supporting the blog and videos. Well, firstly, the break test comes after the unit has already absorbed casualties greater than it's stamina level (except artillery fire and closing fire will cause a test when EQUAL to the stamina rating) and in that regard, units are not testing unless they are already stressed for want of a better word - and the break table dice roll score is only reduced by EXCESS casualties (plus disorder) - so on the face of it, that all seems reasonable, but I did feel that the Union unit on the hill dissolved rather easily when it did not seem substantially disadvantaged against the unit attacking uphill against it. The break and remove from play result obtained by scoring 4 or less on the test is fairly easy to get, if we accept that on 2D6 a score of 7 is average and that 2 excess hits and a disorder would cause the -3 needed to turn that 7 into the deadly 4. Musket fire (with generally 3 dice) has less opportunity to cause casualties compared to the 6 dice from melee. There are certainly two strong character traits in BP, one being that some units will get to move quite far and the other is that units can dissolve quite quickly. Both those things keep games quite dynamic, unpredicatable and solitaire friendly and importantly for many gamers, games become playable in a single session. It does raise the importance of keeping a fresh reserve and of having supports (unengaged units within 6inches ... or centimetres in our case, of the unit concerned). so in that regard the system feels right. Once units are shaken (i.e reached their stamina value of say 3 casualties),you do get a sense that if you do not get them out of the line and use commanders to rally off a couple of those casualties, that the life expectancy of the unit will be short. I think if everything is taken on balance, there is a system working towards weakening the commonly too responsive 'all seeing' player and throwing in a large lump of chaos, giving a good game. The biggest criticism I hear from others is that they have had a fun game, but that the battle had not particularly felt realistic or reflective of the forces and era being played. I get that, but I think there are plenty of other systems that can deliver that, while BP has a focus on delivering a good game and these days, I feel more inclined to go for that. Anyway, after that ramble, to answer your point more directly, mathematically, fire should take longer than melee to bring a unit to the point of testing and when a unit does test, it has already acquired the status of 'shaken' and so in that regard and if I have to jump off the fence, I would say that Break Tests work to the overall good of the game. Norm, hope you did not read my comment as critique of the rules. Far from it. Your explanation of Break Test makes sense to me. Often we cannot discern what exactly is happening to our little men on the field of battle. What we see is an action and a reaction. Is that reaction caused solely from the action? We many times cannot say with certainty. Half the fun (well, for me at least) in gaming is coming up with a narrative to explain the unusual situation and the outcome seen. Rebel regiment charges across river to engage a Federal regiment as the Federals shift defensive position from one side of the bridge to the other. Crossing the river proved to be a bigger obstacle than first thought and the formation begins to lose cohesion as the charge bears down on the waiting Federals. As the Rebels close, the Federals unleash a devastating volley, shaking the Confederate resolve. As the Rebel formation falls back, they notice that they are isolated on the Federal side of the stream and completely unsupported. Panic overcomes the regiment as it tries to make its way back to the opposite river bank. All unit cohesion collapses in the retreat and this fighting force is done for the day. There! I am satisfied with the result. Hi Jonathan, no not at all, hope my answer did not come across as a strong rebuttal of your observation, in fact the opposite is true, I entirely agree with your observations and style of rationalisation. I don't see dice rolls as pure pass or fails, but rather that they are the fabric of the story and that they account for those things on the battlefield that would otherwise take a thousand rules, such as being caught unawares, or there is a small grassy knoll, offering something to hide behind that we don't represent on the table etc. I also don't really like rubber router type rules (repeatedly recovering from rout type devastation). I am very much in the camp of the rigours of war are highly impactive and that units are less able to stay in actual action than we the game would actually like ... before then charging them off to another part of the battlefield, so in that regard high attrition (particularly morale / mental attrition) should be represented in a fairly heavy handed way. BP gives a good at narrative, though not everyone is particularly good at seeing things from a story telling way(or even wants that in a game) and that may be the area that mainly influences whether gamers are fans or detractors of BP. The final vid will be going up within the next hour. Hope you enjoy it and I'm afraid it was another 2AM conclusion of play and uploading, so my tiredness is quite evident on the video - so sorry about that, something to avoid in the future I think. I am so pleased my battle inspired you to do one of your own Norm. I have just found this post, so was unable to watch your videos, however i do like the set up and your modifications. I appreciate that this is now well over a year old, but I am now following your blog, so should be able find other equally interesting items. Thank you for posting links to my YT battle, much appreciated. Thanks Ian, I keep an eye on your channel. Sorry the video content is no longer available, it did help to complete the post.